So when I first turned up at Glasgow Frontrunners and couldn’t run more than 50 metres without thinking my lungs were going to explode, I didn’t think I would stick with it. However, in 2015 I ran three half marathon races, and the club was a major part of my transition from someone who couldn’t run down the road to someone who can happily run that 13.1 miles. The club’s been a huge part of it because my running didn’t really start to improve until I started attending regularly, pushing myself to go faster and further with the help of the jog leaders, and most importantly gaining the confidence to believe that I was a runner. I knew I could comfortably run about 15k but had never had much success with going further than that. I could never get into The Zone and feeling tired, bored and sore would always stop me. A training group with Frontunners, with a baby-steps approach of increasing the distance by about a mile a week worked wonders. Learning from more experienced runners about nutrition and pacing also made a huge difference. I now proudly race in my club t-shirt, which is rather different to a couple of years ago when I was too embarrassed to enter races as a club member because I thought I was too slow. I still have tired days when I think I can’t be bothered or that I will be slower than everyone else. But I always surprise myself when I put my trainers on and get out there, and I finally understand the role that your mind plays in running any kind of distance. And I have a great group of pals to run with too. 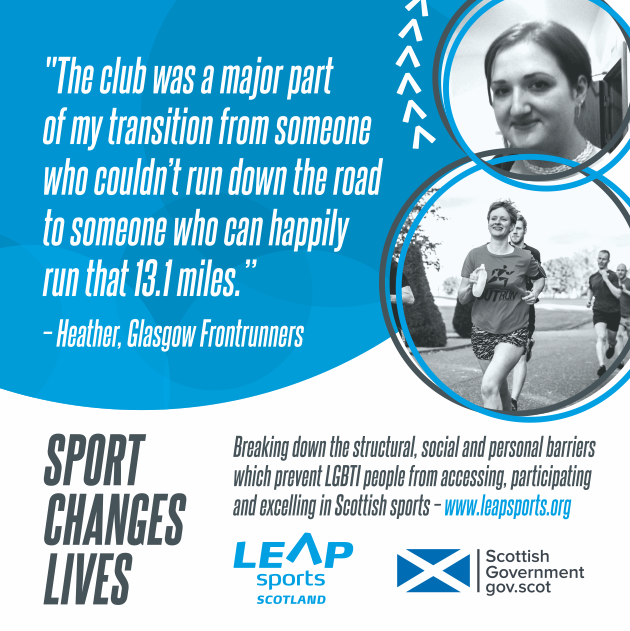 Glasgow Frontrunners is an inclusive community-based road-running group whose aim is to promote health and wellbeing in the LGBT community. We are a friendly club and welcome new members, supporting runners of all levels and abilities from complete beginners right through to competitive runners. Written on 10th January 2017.